Russian Ambassador to India, Alexander Kadakin says the Roerich family estate is a bridge linking the people of the two countries. Jubilee celebrations devoted to the 140th birth anniversary of Nicholas Roerich and the 110th birth anniversary of Svyatoslav Roerich were held at the Roerich Memorial Estate in the village of Naggar in Himachal Pradesh. 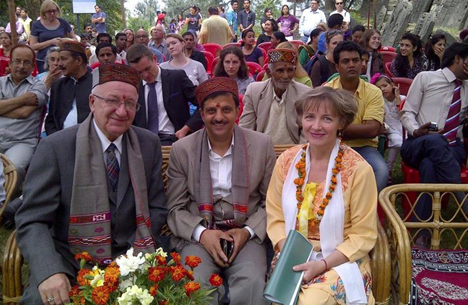 The chief guests of the opening ceremony of the celebrations held on October 4 were Russian ambassador to India Alexander Kadakin, the vice-president and life-member of the guardian council of the International Roerich Memorial Trust (IRMT) and head of the Kullu Deputy Commissioner Rakesh Kanwar. The participants at the ceremony consisted of locals from Naggar and the Kullu valley, tourists from other parts of India and many other countries, who visited the estate linked to life, creativity and philosophical and scientific activity of the remarkable Russian family. Certain renovations were completed in the museum before the celebrations. Now visitors will get an opportunity not only to see the works by Nicholas and Svyatoslav Roerich but also to take a glance at the family’s reception room. Furniture, household items and other preserved items that were used by the members of the family have been placed as in the times of Roerichs. The summer theatre of the IRMT has become the place where official ceremonies and concerts are held. Making the welcome speech, Kanwar stressed the importance of the development of the estate in Naggar as a cultural oasis, in memory of the iconic family. He said the chief minister of Himachal Pradesh, Virbhadra Singh, who is also president of the IRMT, had decided to grant 2 million rupees from special funds for the projects which are being implemented by the memorial trust. Russia perceives this sacred place as a bridge that links the people of the two countries, Ambassador Kadakin said, adding that he sees the IRMT evolving into an attractive centre of culture, spirituality, science and education that unite people in the interest of creativity. “The Roerichs’ heritage has global significant but it does not belong to Naggar, Kullu, Himachal Pradesh, India or Russia. Consequently, we are trying our best with our Indian friends to improve the work of the IRMT to meet the highest international standards,” Alexander Kadakin said. Among the first and foremost tasks of the centre, according to the Russian ambassador is the revival of regular classes for children at the Roerich Art College.